Have you ever heard about Flexso!? Flexso is an SAP Consultancy company located in Belgium and is also an SAP Partner. At Flexso we always follow the latest new technologies from SAP to help our customers with innovation. Therefore, we invest a lot of time doing research. Next to that, we have an internal hackathon at Flexso where we can investigate and do whatever we like with SAP technology based on the needs of our clients. 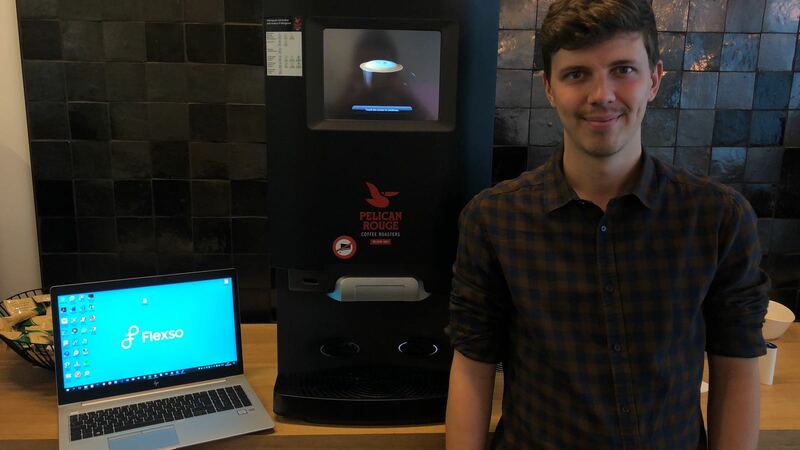 This year Dries, Augusto and I, used this moment to make a Smart Coffee Machine! In the next blogs Dries Van Vaerenbergh and I will tell you how we did this. Most of the coffee machines that have a water supply are using a water filter. 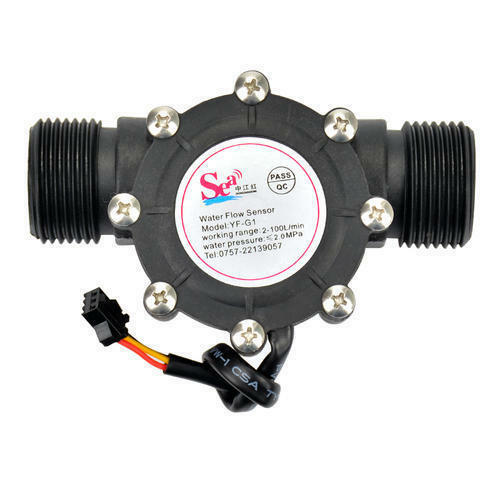 In case you put the sensor between the filter and the coffee machine, you will know when the filter is not working good anymore based on the time it takes for the water flowing to the machine and the pressure of the water. By measuring the waterflow, we can measure the amounts of coffee that people consume and the different types of coffee from distance. Based on the amount of water, it will be a different type of coffee. How to make every Coffee Machine Smart? This sensor enables us to measure the water flowing from the water supply to the coffee machine. By measuring the waterflow, pressure, amount and time we know everything for monitoring the coffee machine. Every time that someone takes a coffee, the machine will take water and water will flow through the sensor. Recently SAP Belgium did some renovations to the building and it now has an SAP Experience Center. In this place, SAP shows demos of SAP technologies to customers. Flexso was able to place the Smart Coffee Machine demo in this SAP Experience Center. In the thing modeler, you can create a virtual twin based on your device configuration. It’s a mapping between a virtual thing and your real device. Here you can combine IoT data with other properties and set authorizations on things. This enables you to allow end-user to only view their own things. This two-layer architecture gives a lot of flexibility. One-layer focusses on device onboarding and security, while the other layer is more focused on the business side of the story without caring about the device itself. With business side, I mean doing analytics on top of the IoT data like creating aggregations and measures. 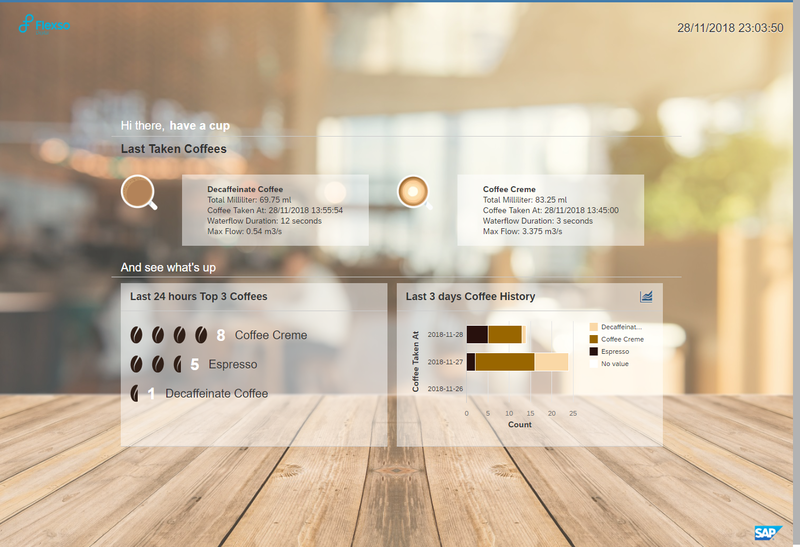 On top of Leonardo IoT service, we’ve created a UI5 app that visualizes the Coffee Machine data. 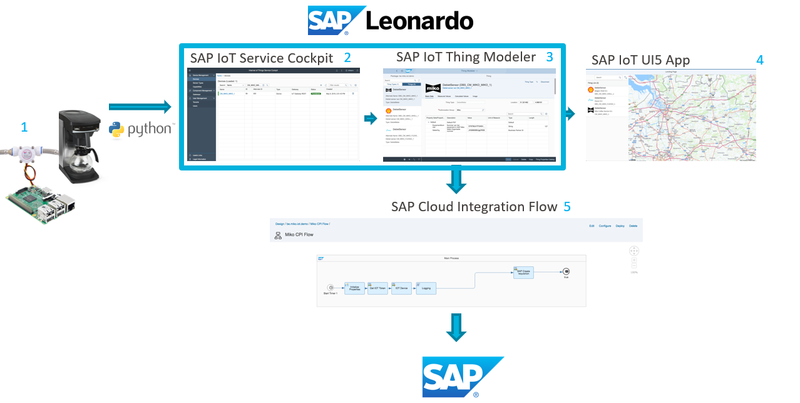 The SAP Web IDE has plugins for creating UI5 apps on top of the IoT service. This will enable you to create IoT apps in no time! Last but not least, we created a SAP Cloud Analytics Dashboard on top of it. This was done by our BW team and won’t be explained here. We just want to mention it that it’s possible. We also used Edge processing in our setup to define the coffee type, based on the amount of water, before sending it to the cloud. Here you have a video on how it works! I want to tell the coffee machine from my desk what coffee I want. Then go to the machine, scan my badge, or enter a code, and have my coffee produced to my specifics. Is that while (or not while) two nuclear missiles are busy chasing you down and thinking about turning into a whale and a bowl of petunias ???? Sorry, I should correct that. I wonder how many heads are being scratched at that ? Should I mention the bruise on my upper arm? Or would it ruin the tension? No, I wouldn’t, just look out for the penquin…..
Nice post thanks for sharing such an impressive blog with us.